When it comes to choosing a weapon for self defense, a flashlight is typically not the first thing that comes to mind. However, when used correctly, it is an amazing tool for personal protection. In this post I want to share some of the advantages of carrying a flashlight for personal protection as well as what to look out for when purchasing one. Given the many advantages, this should be a part of everyone’s EDC (every-day carry) gear. There are No Restrictions: The great thing about flashlights is that, as of now, they are legal to carry in every state here in the U.S. as well as abroad (as far as I know). This is particularly advantageous for those living in nanny states where they’d arrest you if you were found carrying a chopstick. There is also no restriction on carrying a flashlight on airplanes or in other areas where handguns are commonly prohibited (such as the post office). Given the way things are going here in the U.S. however, I wouldn’t be surprised if flashlights get added to the list of restricted weapons. 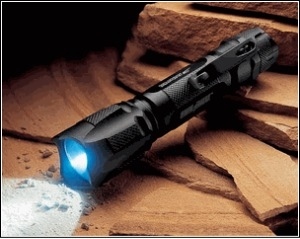 Flashlights are Discreet: Flashlights in and of themselves are very discreet. If a flashlight were to drop out of your pocket or bag in a public area, it wouldn’t raise an eyebrow. Contrast that with the reaction you’d get if your knife, or worse, handgun were to drop on the floor as your sitting in a subway car – yeah, not good. Unless you have one of those 12-inch flashlights with razor-sharp beveled tips that more resembles a medieval mace than a flashlight, then you should be good. Disorientation Factor: Especially at night, there is something about getting a wallop of lumens hitting you square in the eyes that can mess with your orientation. Have you ever been pulled over by a cop and have him shine his Maglite in your face? It’s disconcerting; and meant to be so. Many confrontations and potential attacks can be thwarted by simply shining a bright flashlight in your would-be-attackers eyes. Effective Against Animals: Animals, even more so than humans, become disoriented and confused when a bright light is shined in their eyes. When using really bright lights (100+ lumens) animals often react by running away. Illuminates Threat Areas: No other personal protection tool has the ability (except perhaps Night Optical Devices) to illuminate a low-light area. 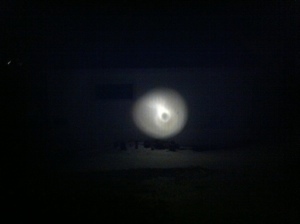 Since human predators like to use the advantage of the cover of darkness when lying in wait, a flashlight can remove that advantage and disrupt their attacks. Provides a Tactical Advantage: When coupled with other self-defense weapons, a flashlight provides a great tactical advantage. Not only does it illuminate threat areas as mentioned above, but it can blind an attacker which can disrupt aim and focus. From the attackers standpoint all they see is a wall of light and a dark silhouette behind it (that would be you). This not only masks your position but will mask any weapons you may be holding such as a knife, baton, or pistol, providing you with that tactical edge you need to come out alive. Palm Sized: You want a light that is convenient to carry with you at all times. Your 500 lumen “mace” will do you no good if it’s under the seat of your car when you’re caught alone on a dark street. At Least 100 Lumens of Light Output: 100 lumens causes significant pupil constriction and a “blinding” aftershock due to momentary retina burn. It will even cause momentary blindness in daylight. This allows sufficient time for a surprise attack that will cause your attacker to think twice about continuing. LED Bulb Type: LED bulbs last significantly longer than incandescent and cause less battery drain. Rugged Housing: You want a light that is sturdy enough to stay lit even if dropped, kicked around, manhandled, or used to deliver a blow. Typically look for those made from mil-spec hard anodized (Type III) aluminum which will be very strong and very light. Waterproof: You want to buy a flashlight that is sealed on both ends with rubber o-ring gaskets. This will keep out water even when submerged. 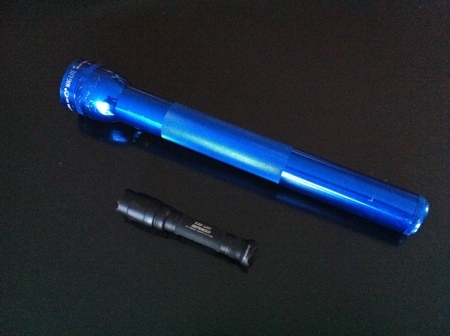 Established Brand: Flashlights, like any other tool, can break down with time. Be sure to buy one that is from an established brand and stay away from the cheap knock-offs. That way when you need replacement parts, they’re only a call away. In fact why not buy some replacement bulbs, o-rings, and batteries ahead of time. This way, you’ll have them when you need them. CandlePower Forums: For those interested in learning more than they ever wanted to know about flashlights, check out this forum. It’s filled with a slew of highly-knowledgeable torch junkies. SureFire True Stories: Here are some true first-person accounts of military personnel, LEOs and civilians who had to use their flashlights to defend themselves against attackers of both the two-legged and four-legged variety. At Palladin Press you can buy a DVD by Steve Materkowski [an instructor from the SureFire Institute] on Defense/Offense using Tactical flashlights, also from the CrimsonTrace website you can request a FREE-DVD on use of a Tactical flashlight for Shooting/Defensive use and movement. Thanks for the great info Booter! The Palladin Press DVD looks pretty good. btw, I checked out the CrimsonTrace.com site but the free dvd seemed related to laser sights and not flashlights. That notwithstanding, they do allow you to see the DVD online as well and the laser sight advantage in a stressful combat situation is amazing. Update: I did watch through the whole series now and the one on low light does have some good flashlight tips. thanks again for the good info. Good article. I had not considered the flashlight as a self defense tool before. Thanks for the good information. You’re very welcome. You’ve got a nice blog btw. I recently found a Streamlight product that is decently priced and produces 120 lumens from 2 inexpensive AA batteries. It’s the PT-2A flashlight and is sized similar to a fatter writing pen. It has 3 modes all accessed from the push-button tail cap. Bright, Bright Strobe, & Low. Low produces around 15 lumens for over 20 hours. It is Bright on default mode, and lasts around 2 hours. To access the other 2 modes, you have to push in on the cap half-way. You do that twice, you turn on the Bright Strobe which will give you a longer run time than constant Bright. Do it three times and you get low power. It’s a little tricky to get the hang of it when inspecting it at the counter with a store clerk that doesn’t know how to turn the different modes on, but after reading the very brief directions, you’ll get the hang of it real quick. I picked mine up for $55. I also discovered a company producing small tactical lights called 4sevens. Their product line looks quite interesting. If you dazzle the eyes of an attacker at night, or in a dark building; they will have a problem with carrying out the attack. I dazzled my eyes with the streamlight in a small room illuminated by a 40 watt lamp and I had difficulty seeing for a few moments. Plenty enough time for “Fight or Flight”. Thanks for the info on the streamlight. I wasn’t aware of that company and will have to check in to them. As for 4sevens I’ve heard good things about them and the price is right. What tactical light is that at the top of the artical on the rocks? The light is the Brite Strike Tactical Blue Dot. They are good lamps albeit a bit pricey. Yeah, I finally did a google search (images) and found one. I ended up ordering the Fenix TK12. Your artical was really insiteful and helpful with my decision. You’re very welcome Brandon. Glad you found a keeper. Well as much as I like to spend a ton of money on a surefire. I just got a three pack of 300 lumens light from Cosco for $15. Small, compact, replaceable and waterproof. Always keep an eye out for a good deal. Kassua.com offers cheap quality products online such as fashion, phones, electronics, home and kitchen appliances at great prices. Buy tablets online at low prices in Nigeria’s. Shop tablets for best prices from various sellers within Nigeria’s. latest Tablets Online in Nigeria’s. from leading brands – Samsung, Apple ipads, Micromax tablet, Dell, HCL, BlackBerry, Karbonn, Zync etc. Get low price tablets, FREE shipping, EMI* & CoD options across Nigeria’s. Saw Brandon Webb demonstrate the use of a high illumination flashlight. Wanted more info and got all I needed here, really good site, many thanks!! Hi, this is great guide on how to select the best flashlight for self defense. I really loved your comparison and look of the site. You seem to be expert in this. Nice one, Erich. I had success with my flashlight choice, and I usually buy 200+ Lumens with one LED bulb. One suitable bulb, with one deep, smooth reflector, is the best and working excellent for me so far. Lumens is not always the most important factor. How many bulb you have and the reflector is also important. Overall, you need a balanced one. Tac lights have sure come a long way and I completely agree with you that, once you experience these powerful lights, they can turn into a go-to for self defense with less risks that come with knives, guns, sprays etc. You’ve got to get a quality flashlight with the right amount of lumens and not something with a weak beam like http://www.foreverflashlights.com or something like that. Not only can a tactical flashlight disorient but when placed in your fist, it can also be used as a blunt force weapon as a last resort. Great article, thanks for posting! -Fantastic Post ! We are top 10 led lighting manufacturers in india, known for its open-minded products of led brands and a combination LED lighting range. Flashlights in and of themselves are very discreet. If a flashlight were to drop out of your pocket or bag in a public area, it wouldn’t raise an eyebrow. flash light that is sealed on both ends with rubber o-ring gaskets. This will keep out water even when submerged. Thank you to sharing this post. These flashlights are also useful when you are driving alone on highways. If your car does any problem, you can use this emergency light to check what is wrong with your car. It also has other uses. Tac lights have beyond any doubt progress significantly and I totally concur with you that, once you encounter these effective lights, they can transform into a go-to for self protection with less dangers that accompany blades, weapons, showers and so on. You must get a electric lamp with the perfect measure of lumens and not something with a frail pillar like something to that effect. Can a strategic electric lamp bewilder as well as when put in your clench hand, it can likewise be utilized as a limit compel weapon if all else fails. Incredible article, a debt of gratitude is in order for posting! Tac lights have beyond any doubt progress significantly and I totally concur with you that, once you encounter these effective lights, they can transform into a go-to for self protection with less dangers that accompany blades, weapons, showers and so on. You must get a quality electric lamp with the measure of lumens and not something with a frail pillar like something to that effect. Can a strategic electric lamp bewilder as well as when put in your clench hand, it can likewise be utilized as a limit compel weapon if all else fails. Incredible article, a debt of gratitude is in order for posting! Tac lights have beyond any doubt progress significantly and I totally concur with you that, once you encounter these effective lights, they can transform into a go-to for self protection with less dangers that accompany blades, weapons, showers and so on. must get a quality electric lamp with the perfect measure of lumens and not something with a frail pillar like something to that effect. Can a strategic electric lamp bewilder as well as when put in your clench hand, it can likewise be utilized as a limit compel weapon if all else fails. Incredible article, a debt of gratitude is in order for posting! That looks like a pretty awesome flashlight, especially for the size. 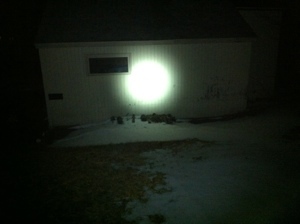 That does look like a good tl900 led headlamp. Thanks for sharing such nice information.